Bidirectionally sync your Products, Contacts, Invoice and Quotes between your SuiteCRM and QuickBooks online with SuiteCRM QuickBooks Integration. The sync is performed securely with QuickBooks API. The module allows you to perform both instant sync and schedule sync. The scheduled sync enables you to queue any number of sync process and that can be triggered at non-peak to enhance server performance. Set the cron once and forget forever. The sync will be triggered at the defined frequency perfectly to keep both your CRM and accounting software updated. The server load can also be perfectly balanced by transferring the records in non-peak hours. And you've complete control over how you perform your data sync. The records to be synced are queued one after the other to be updated in an orderly sequence to prevent unwanted data conflicts. 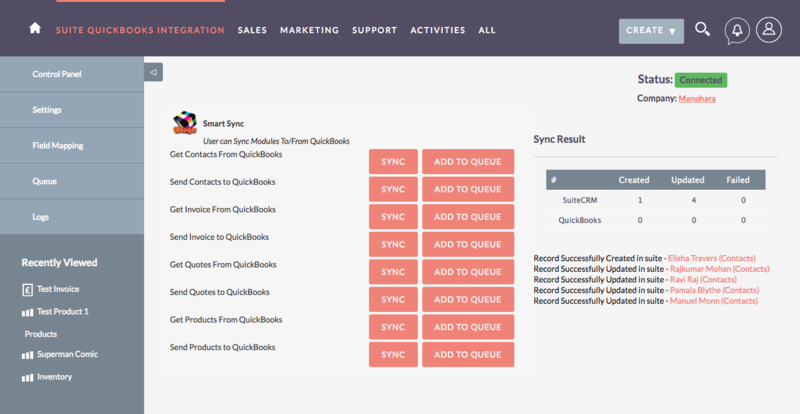 SuiteCRM QuickBooks Integration helps you to sync the records at anytime. You can trigger the sync after each time you make any changes in your SuiteCRM and QuickBooks. When you import products in bulk, then you can instantly create those information in your QuickBooks online accounting software without juggling between QuickBooks and SuiteCRM. 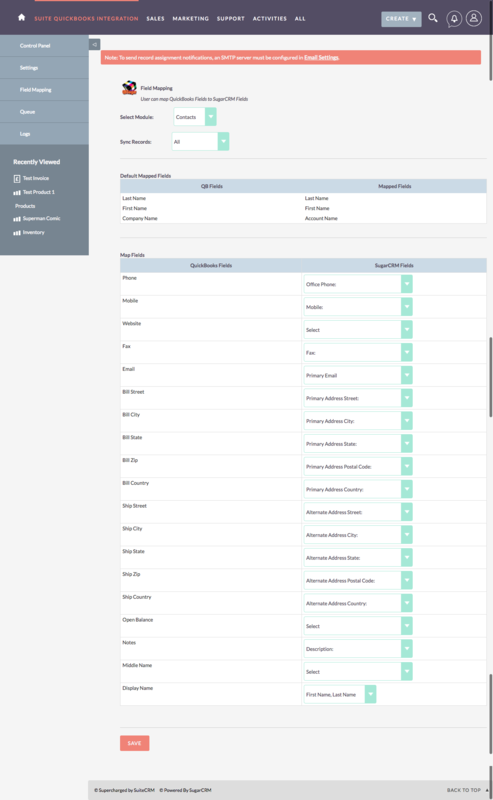 All the records are magically updated in a single click and saves more time without doing redundant tasks. The simple mapping interface enables you to relate the corresponding SuiteCRM fields with QuickBooks online fields and places the data in exact field location. The Name and Company names are pre-mapped and the other field information can be related to the field of your choice. And the fields are chosen from the list of fields in the dropdown. The field mapping need to be done separately for each Lead, Contact, Invoice and Quotes module. We hope that you never lose your data, but someday it might happen due to any connectivity barriers. 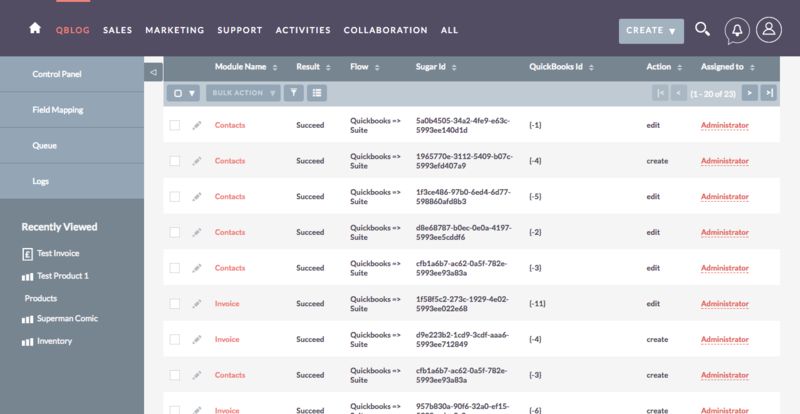 But SuiteCRM QuickBooks Integration got your back, it has a complete log history of the transferred data. QuickBooks SuiteCRM requires ionCube Loader version 4.0 or above. The product works only for QuickBooks online. The product will not work beyond the scope of SuiteCRM and QuickBooks. The synchronization is performed with the advantages and limitations of QuickBooks API. Our Smackcoders support team will help you for FREE on installing QuickBooks SuiteCRM Integration, and we are more than happy to achieve your goals together. The technical support help can be provided only on sharing us your development server access. Because in most case the issue will be with the environment conflict and predicting the issue is hard. We will help you in all means to get the product work for you and your satisfaction is more important to us. We are here for you to make the customized version of the add-on that exactly fits in your need. Additional charges will be applied based on your requirement. You can send us your details at support@smackcoders.com. Learn everything that QuickBooks SuiteCRM Integration can do for you in documentation.